Maker Faire Hq. explains there are two ribbon categories: a blue ribbon for best in show, and a red ribbon for best in class. The red ribbons are also used to show the Maker has an educational element. To show people what today’s ham radio operators are doing with the newest technology, and to change the image of ham radio, making it both contemporary and chic in a hi-tech way. We also want to emphasize how ham radio can be used for science and technology education and a possible career path for youngsters. Our projects demonstrate how ham radio technology changes with the times, yet still includes both past and present to accomplish one thing: Creating ways to communicate voice and data over the ether, without wires. Maker Faire Hq. keeps track of Makers as they (we) win ribbons. Notice several Makers have multiple ribbons. 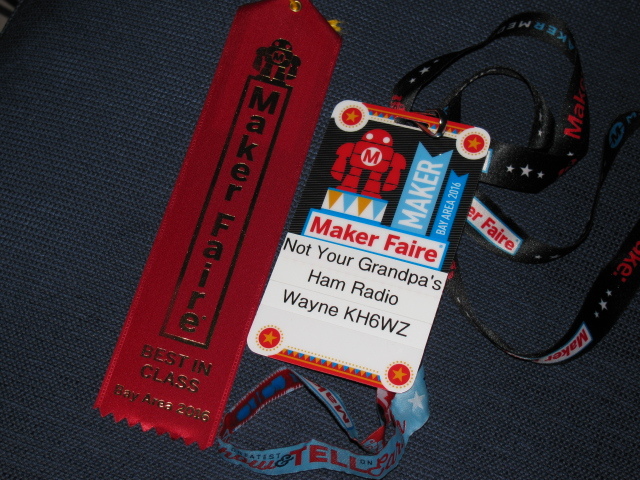 Now we have an additional Maker Faire goal: We need to win a ribbon each year. Left to right: Dennis Kidder W6DQ, Lisa Gibbons KF6QNG, Wayne Yoshida KH6WZ, Marty Woll N6VI, Patricia Yee, Brian Yee W6BY. Not pictured: Joel Wilhite KD6W, Victor Frank K6FV and Paul Zander AA6PZ. The new polo shirts made by Dennis gave booth staff a professional look. Photo by Dennis Kidder. Hungry Makers ready for paella and various beverages after setting up their displays and activities. 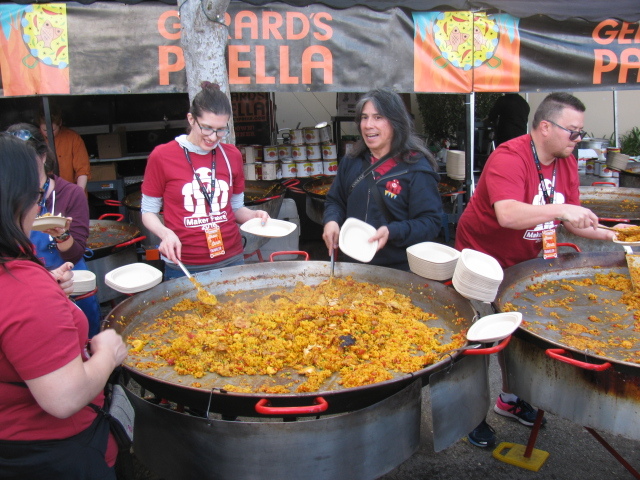 Volunteers scoop and serve paella to the Makers after Maker Faire Bay Area setup day. Gerard and his nephew Tom as the paella feast winds down. This is a tradition at the Maker Faire Bay Area: Gerard’s Paella. Gerard Nebesky trucks in his crew and giant paella pans, which are about 20 feet in diameter. Gerard feeds over 2500 hungry Makers on Friday evening. 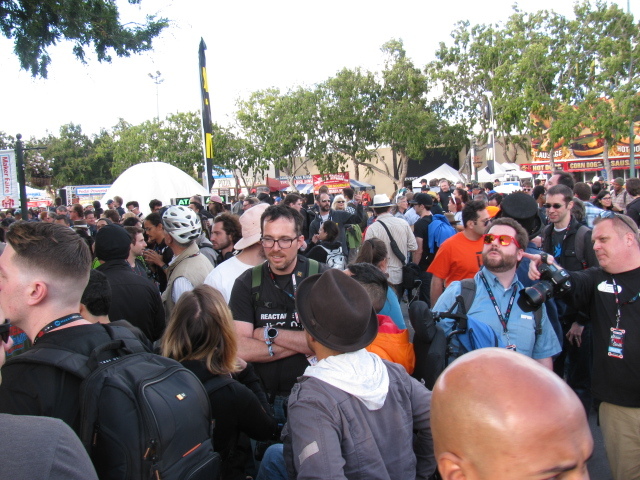 A great big Thank You goes out to Gerard and his Maker Faire crew! 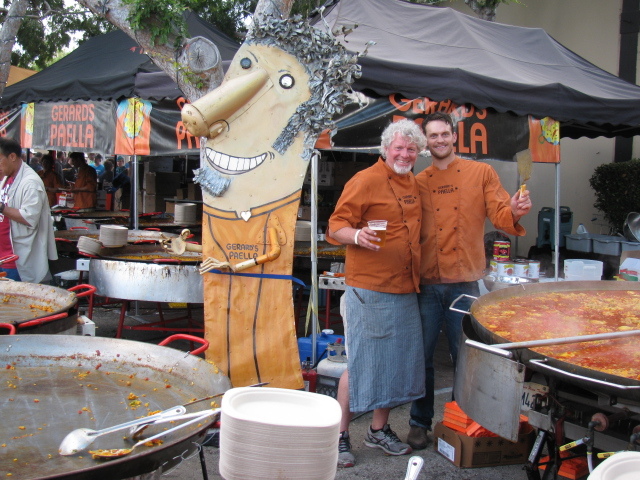 Here’s a quick video of the paella feast at the 2014 Bay Area Maker Faire. 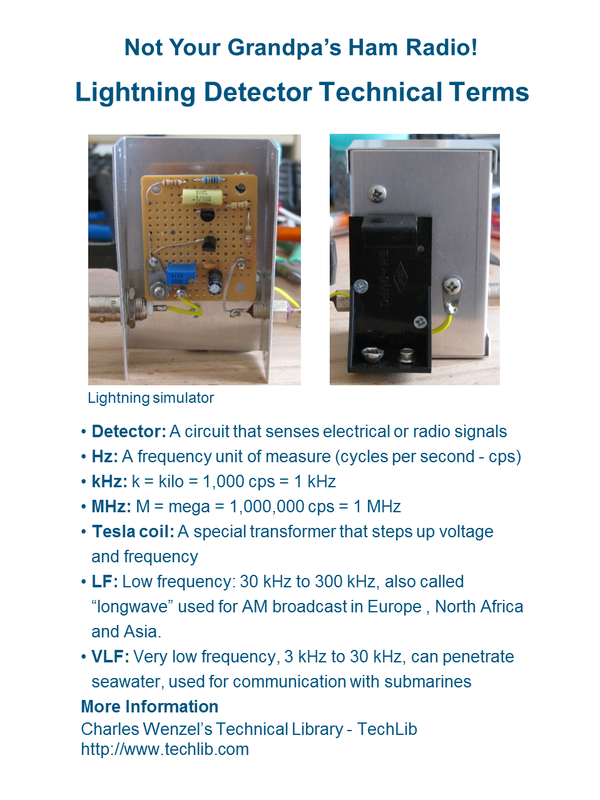 The completed lightning detector-300 kHz receiver completed a few nights before the Maker Faire. On the right is the “lightning simulator” – a piezo BBQ striker in a plastic pill bottle. 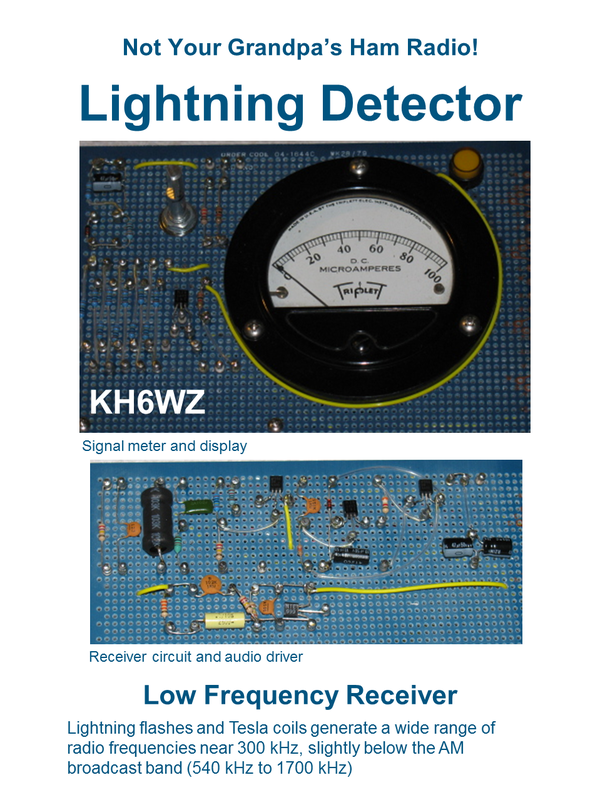 The lightning detector-300 kHz receiver is built into a broken LCD TV cabinet. Originally, I thought I could re-use the power supply, infrared remote control and audio amplifier. Unfortunately, the TV is built with a small number of ICs with multiple functions. The power supply performed strangely when I probed around to map out the output voltages. Since I was on a tight schedule, I gutted the unit, and kept only the speakers. The Lightning Detector is a “resonant tank circuit” which detects the electrical impulses, amplifies them so the noise can be heard on a speaker, seen on the yellow LED and moves the needle on the meter. 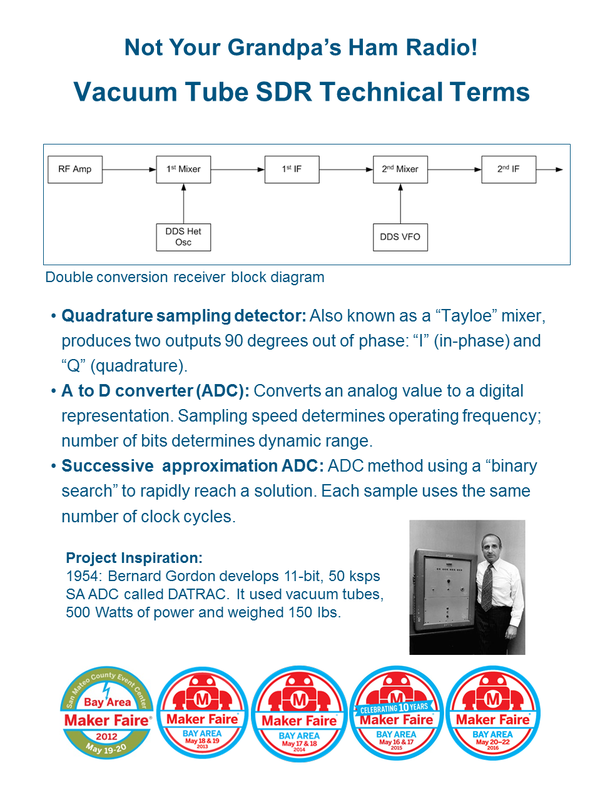 Information on this circuit comes from Charles Wenzel’s Technical Library (TechLib). 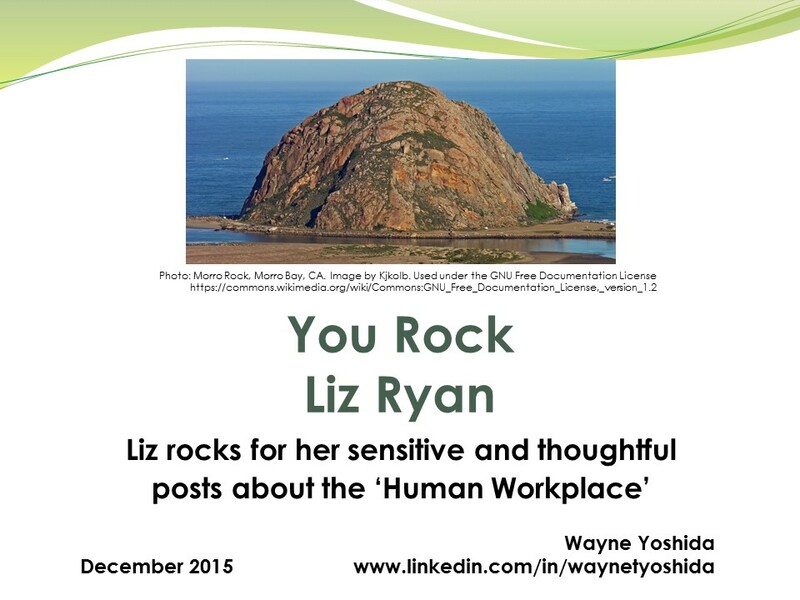 There are a lot of interesting projects and includes a gallery of readers’ projects. A what made with what? This is an interesting mix of old and new. Dennis Kidder, W6DQ, came up with this idea. 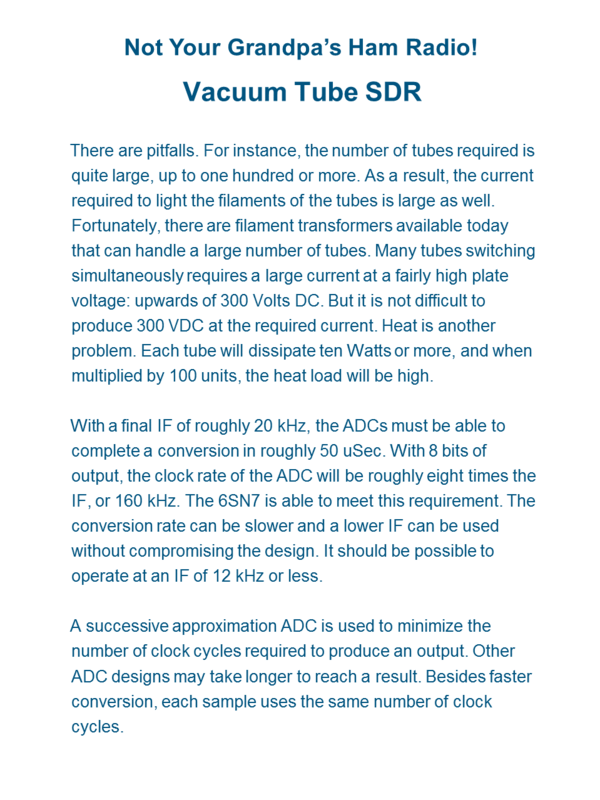 Vacuum tubes are fully capable of performing many of the same functions as modern solid-state devices. Brian Yee, W6BY, brought his Amateur radio beacon. A beacon is a one-way radio transmitters usually used as “propagation indicator” to help see how signals are traveling through the air. They can also be used as a signal source or reference to measure frequency, calibrate radio receivers and test antennas. 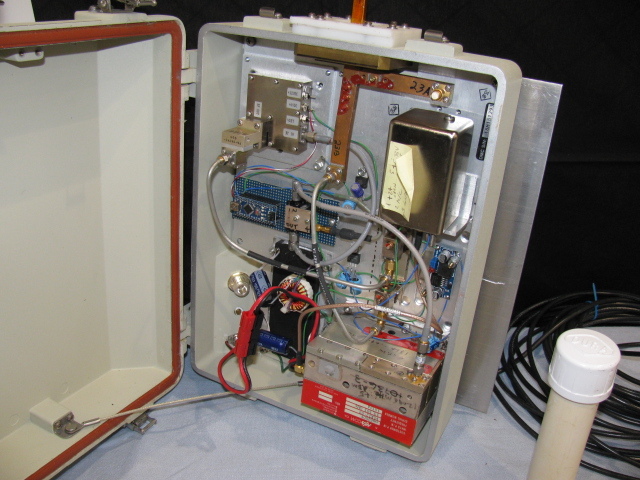 Brian’s beacon operates on the 24 GHz band, and is made with modified microwave telecommunications sub-assemblies. An Arduino Nano is used as the beacon identifier. It sends out Brian’s ham radio callsign W6BY every 10 minutes (an FCC requirement) as well as a series of tones to help locate and identify the beacon. 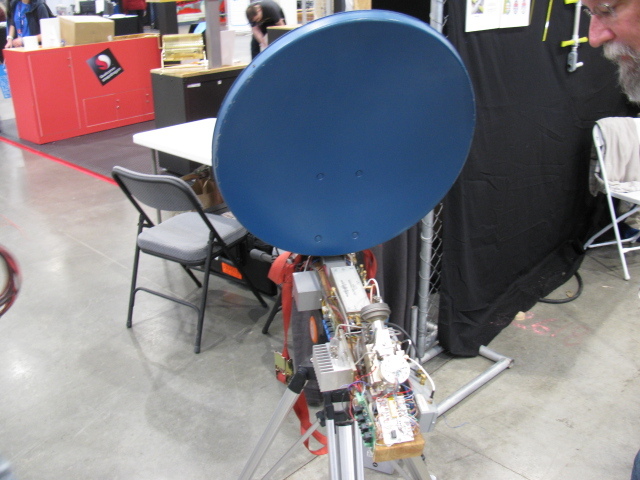 Marty Woll brought a portable spectrum analyzer and an assortment of hand-built antennas, including this corkscrew (circular polarized) antenna. A weak signal source was placed at the far end of the booth. By moving the antenna around, the spectrum analyzer shows frequency and signal strength. This can visually demonstrate antenna polarization and direction as well as frequency and harmonics. The “anchor project” from past events is my 10 GHz transverter system. This station is used to demonstrate and explain frequency multiplication and division, frequency up-conversion (transmitting), down-conversion (receiving), polarization and antenna directivity to non-hams and even children. 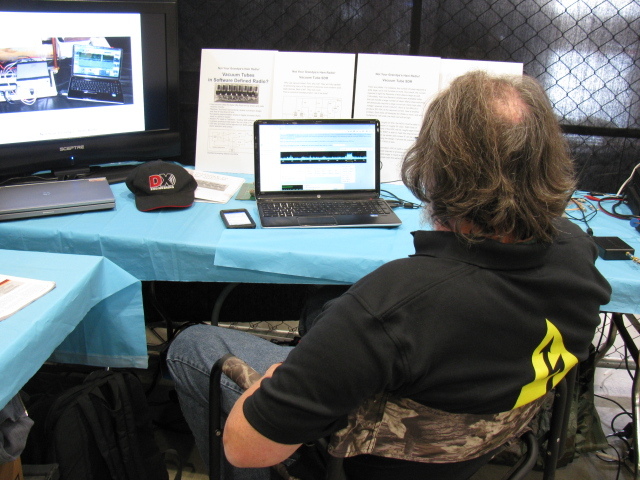 Dennis Kidder W6DQ, displayed his software defined radio (SDR). 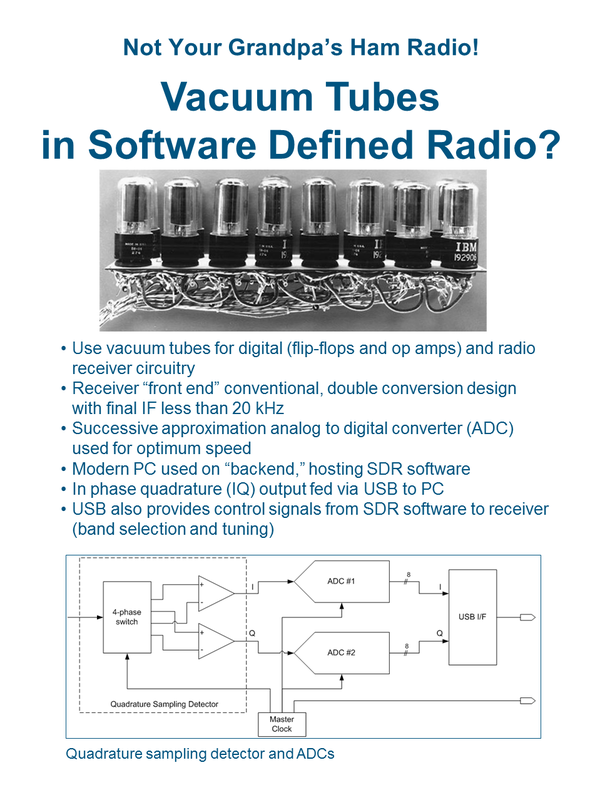 There were many questions about SDRs and many visitors were surprised to learn ham radio operators have this technology. But this is another example of what radio hams are using these days. ADS-B is the “next generation” air traffic control, to replace/supplement ground-based radar. Each aircraft transmits identification, GPS position, flight information and other data. Antenna for 1090 MHz, this can be built with cable TV coaxial cable and a few other items. 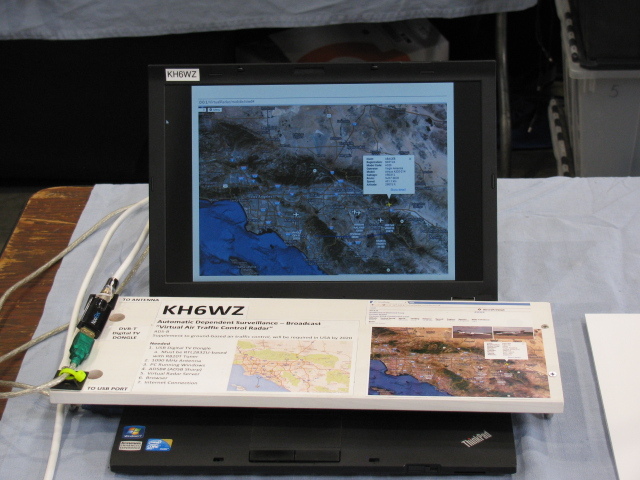 An inexpensive (less than $20 US) digital TV software defined radio in a USB dongle is used to decode ADS-B signals. Free downloadable applications for Windows PCs are used to decode and display the live air traffic broadcasts on a computer. There is one important thing to know when buying your DVB-T dongle: The decoder and display programs work only with dongles using the Realtek RTL2832U with the RaefaelMicro R820T Tuner chip set. 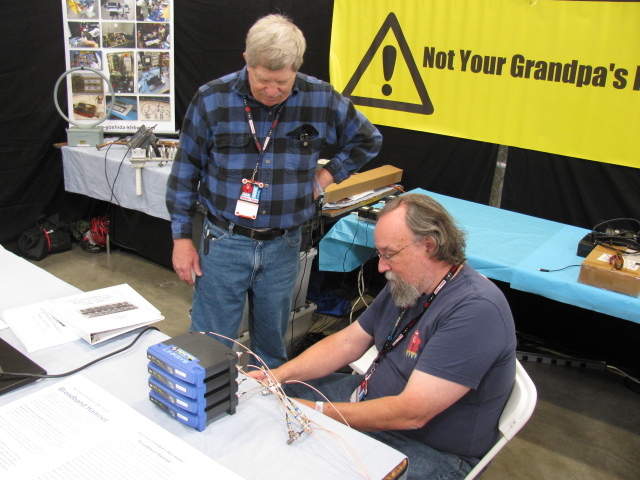 Dennis W6DQ (seated) assembling the BBHN network demo as Marty N6VI asks a few questions about the network. Broadband Hamnet (BBHN) re-purposes commercial Wi-Fi equipment to operate only in the ham bands to create robust, wireless, IP-based networks suitable for emergency communications or remote monitoring and control. Commercial Wi-Fi equipment is restricted through FCC Part 15 regulations, limiting power and range and precluding the user from modifying type-accepted products. However, licensed ham radio operators are legally allowed to modify Part 15 devices to make them operate in the FCC Part 97 rules for ham radio operation. 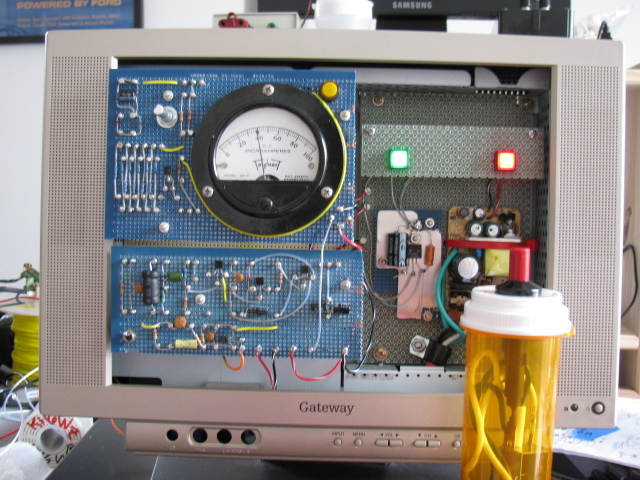 Larger antennas, higher power, adding receiver pre-amplifiers and other techniques are allowed for experimentation. The result is a system which creates an ad-hoc, meshed network, supporting IP traffic, e.g., voice, video and data. A meshed wireless network affords greater reliability by providing alternative route paths in the event of a failure. Dennis says there sure a lot of wires needed for wireless networking. Note: There are two systems for amateur radio wireless networking – Broadband HamNet (BBHN) and Amateur Radio Emergency Data Network (AREDN). If you are interested in experimenting with this, check with others in your area to see what they are using. 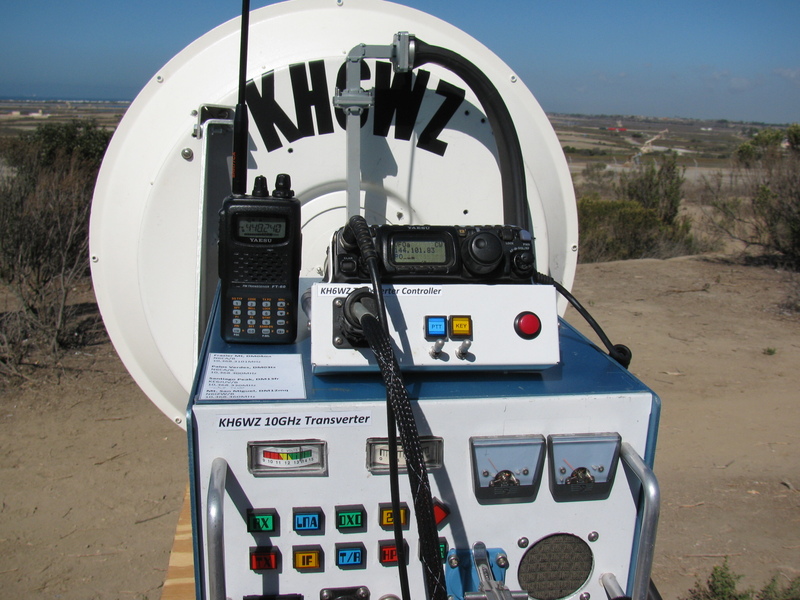 Joel Wilhite KD6W constructed a 10 GHz and 24 GHz dual-band transverter system for portable use. It consists of various modified modules from several sources. We encourage kids and parents to talk to each other using our home-built radios. It helps make things more interesting than just looking at things. 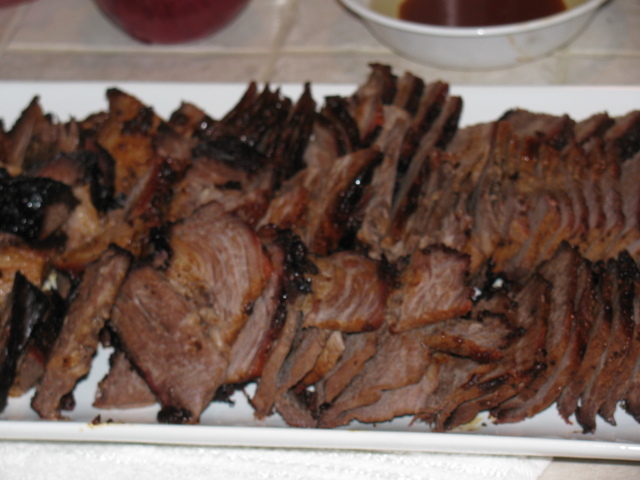 I made a brisket for the first time a few weeks ago. 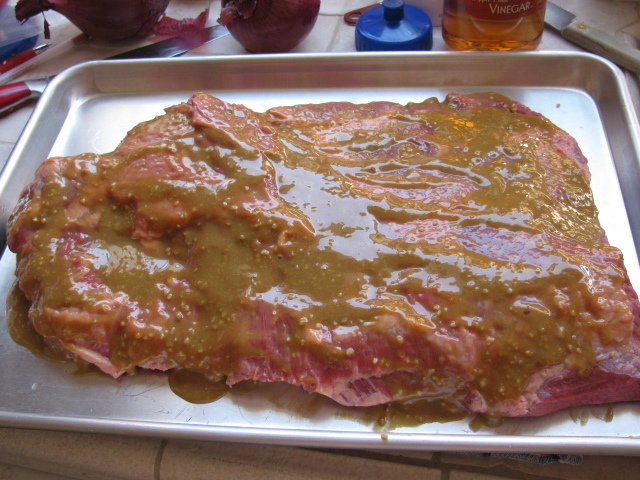 I followed the directions in Steve Raichlen’s BBQ University (“Smokelahoma” Brisket), and used my large Big Green Egg. 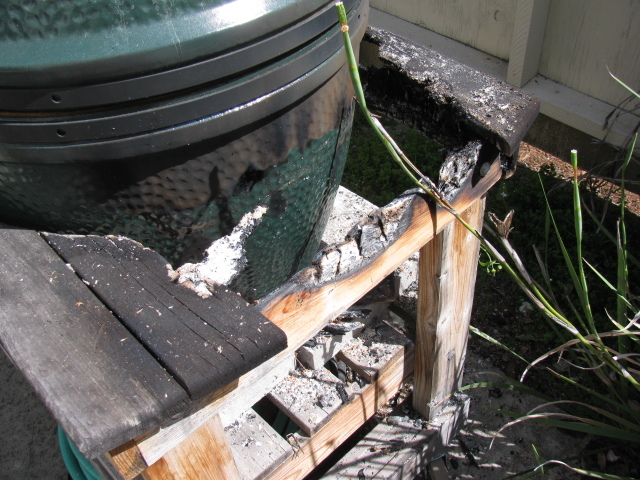 But, there was a casualty — there was a fire in my cooker and table, discovered this the morning after my cooking was done. I think the gasket failed. 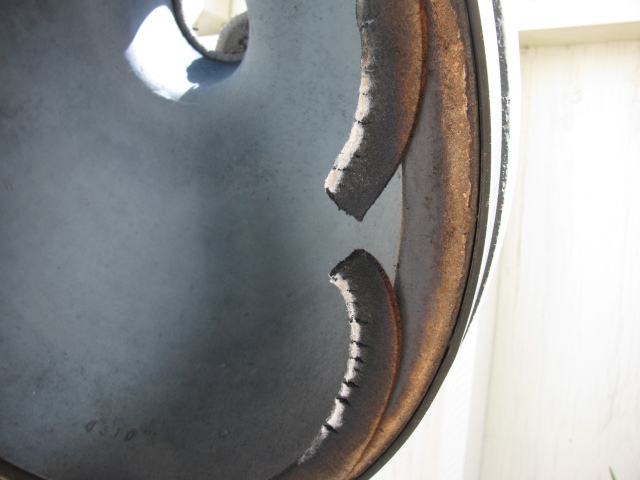 I have a picture of what looks like a “blow-out” the gasket is actually curved / curled outwards. I believe this happened because the outer shell was cracked – remember I dropped it when it was new? It finally gave out. It is also interesting to see how it changed when I moved it outside to store. It used to be inside the garage. I noticed the shell would sweat – water would come out of the ceramic shell when cooking with it. So there’s expansion and contraction. All contribute to the fire. The fire box was over-loaded. 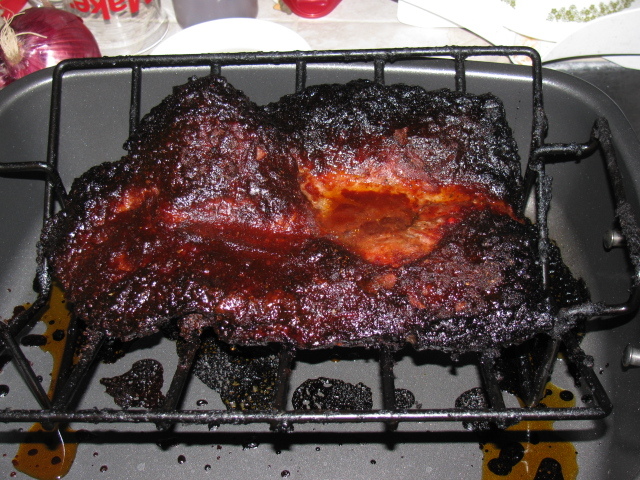 I did not want to re-fuel during my cook (9 Lb brisket). Filled it too high. Lit the fire, temp was about 200 degrees to 225, low and slow. 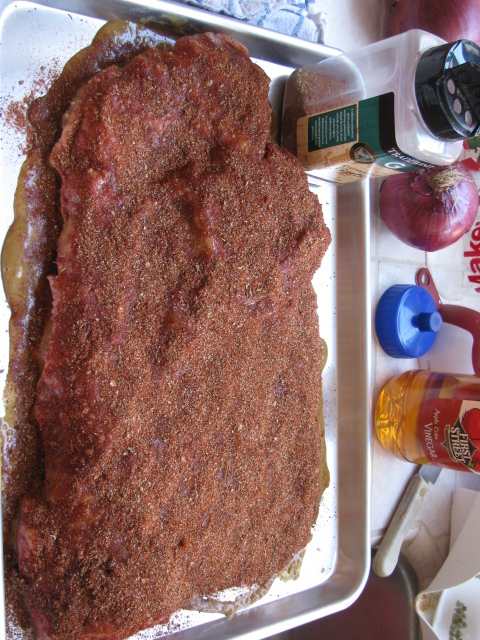 Cooked for 6 or 7 hrs. After it was done, I did my usual “sterilization burn” — open all the vents fully open and closed the lid to clean everything. 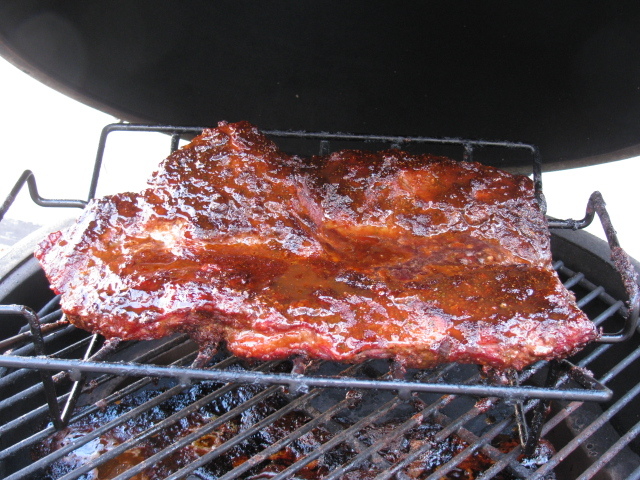 The crust was sugary and so added an element of catalyst to the fire, along with the grease. 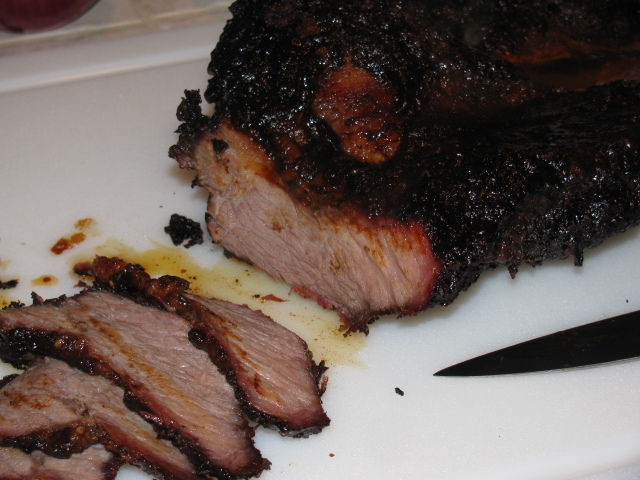 By this time it was very dark outside, I had to use a flashlight to check the temp and the meat. I thought I saw the thermometer pegged all the way, so it was more than 700 or 800 degrees. I wish I could have seen the fire! Easter Sunday morning, I looked outside – and saw the table. No smell, no fire, I think there was early AM dew. So the fire was out. Notice the table stopped burning by itself. Lucky. I guess the good news is — I get to buy a new one! 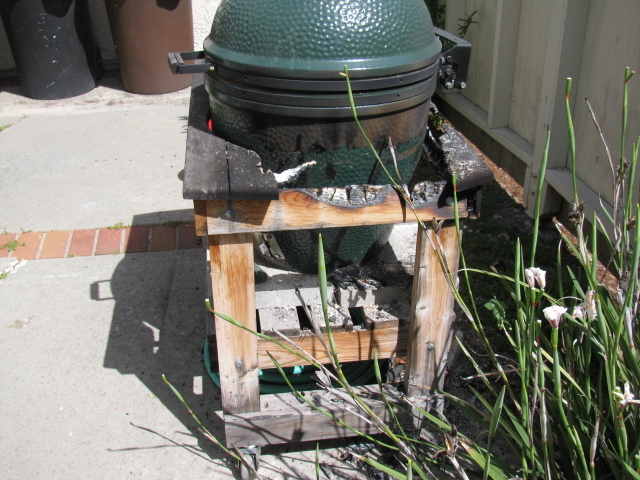 The timing of the So Cal Eggfest is great, I can make it to this on on June 11 – This is a great way to see these cookers in action and meet the crazy fans of this interesting smoker – grill – oven – outdoor stove. I spent the last two weekends in the garage, getting back to the Coupe Project. It was nice and relaxing to lay on the creeper, under the chassis and working with tools again. 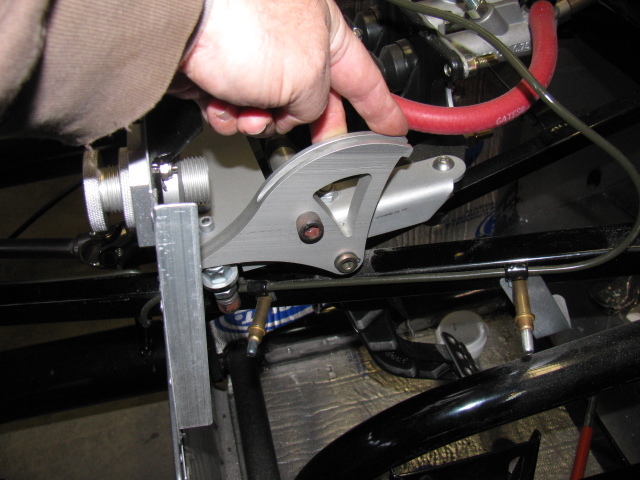 I had to modify the chassis in the pedal box area to allow more clutch pedal movement. This is a known issue in the Roadster forums, but not so much in the Coupe forums. 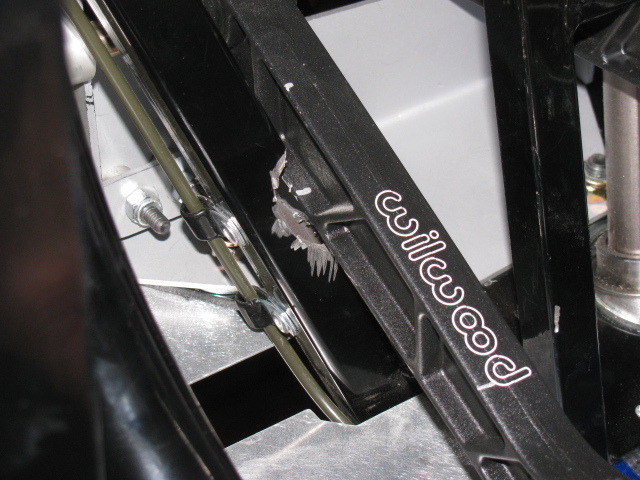 This happened when Factory Five Racing changed the Wilwood pedal box – the old version would actually break. The new and improved pedal box moves the clutch pedal arm over to the left by about an inch or so, and the arm hits a brace, limiting pedal travel. When the modification is done before the pedal box is bolted into place, it is a simple chore to make two cuts, chopping a small triangular cut into the frame member. This can be done with a reciprocating saw or maybe power jigsaw. However, if the modification must be performed after the pedal box is bolted into place, the tube must be accessed from below, in an awkward angle. A small grinder tool would be ideal for this, but the only tool I have that will fit the space and the angle is a Dremel tool. 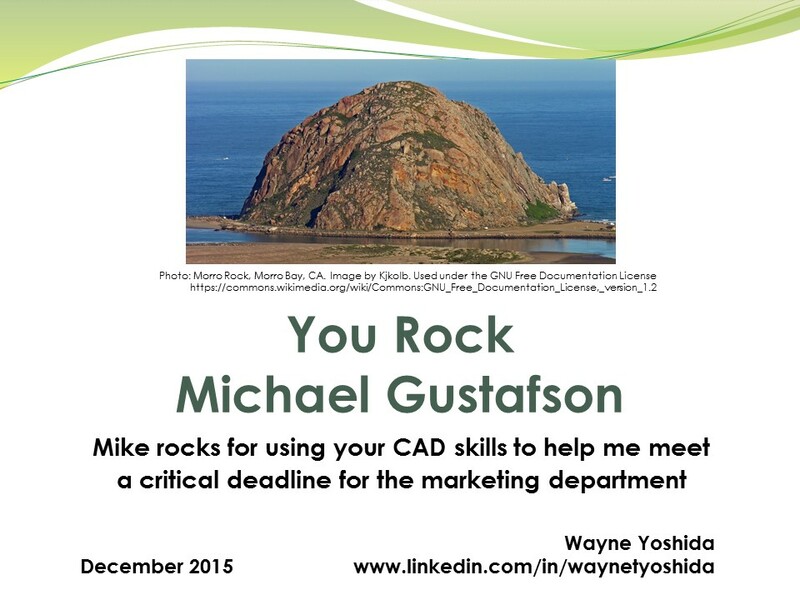 It took me two half-day sessions to do this. In the pictures above you can see the half-moon shape cutout I had to make. This is a view from under the chassis, looking up from the creeper. This will be painted black later. The tube looks normal from the top, so that is good. 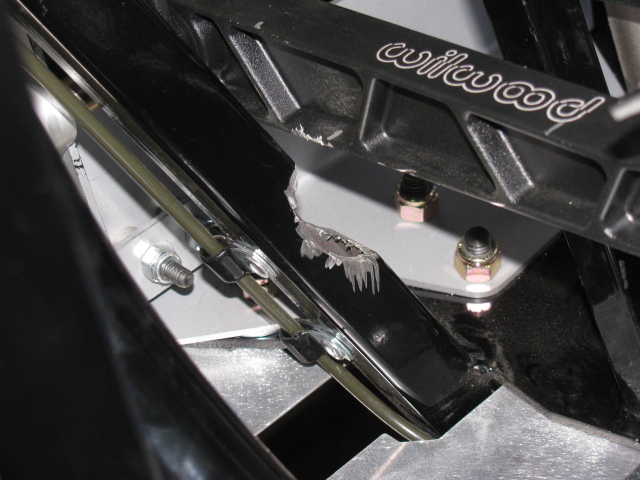 And clutch pedal travel is doubled, so free play adjustment range should be much better. Since the brake system is installed, filled and bled, I removed the Clekos and riveted the lines in place. I changed several P-clip anchor points so it complies with my “routing and clipping manual” from the office. Unfortunately, I followed some other builders’ clipping, and mounted several p-clips upside down. Most of them will be under the car, and might be hidden from view when the car is finished. But I know they are upside down. Here is a picture of how the clips should be mounted. This is the X-member in the front of the chassis. Looks like I didn’t take a picture of the riveted clips. I will post them later. 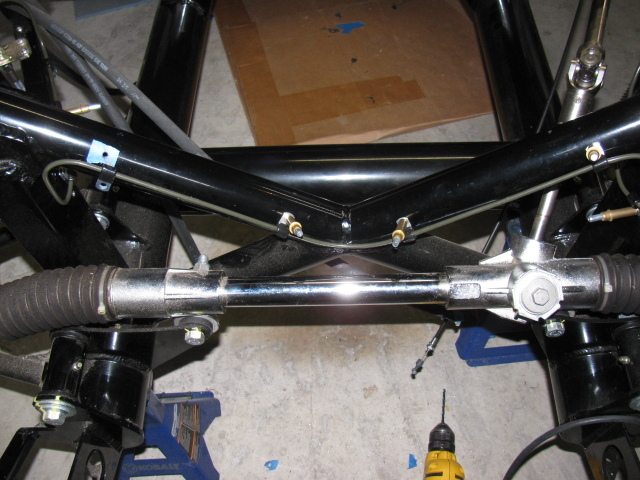 Next, I made a bracket to support the ECU for the MSD Atomic fuel injection system for my 302. This plate will secure the ECU and provide strain relief for the cables going in and out of the unit. It is on a plate so it can be easily removed if I have to work on the wiring or the ECU later. It is mounted with 1/4-20 stainless steel studs and nylon lock washers. It was raining so I was not able to paint this plate. Will have to do that at the next build session. The passenger side footbox is on the left. Three stainless steel Allen head screws come through the wall and into the passenger box. The center photo shown the ECU engine cable going into the engine bay, and the right photo shows the MSD computer and plate inside the passenger footbox. Carpet will cover the interior, so a carpeted cover will be made to hide the ECU and wires when the car is finished. I am also laying out the air conditioner system components on the chassis. I have to make several brackets and small boxes to mount the A/C components on the chassis. First, it will shorten the battery cables, decreasing the voltage drop. 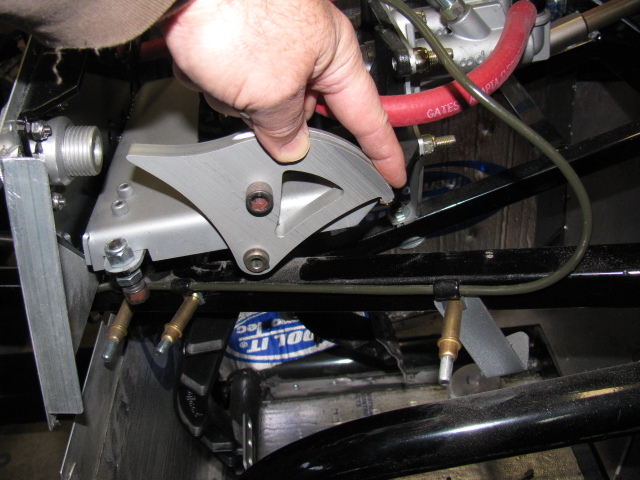 Second, the “factory location” for the battery – in the rear center – blocks the rear axle pumpkin. So, when I have to change the oil or make adjustments, the battery must be disconnected and the battery and the box must be removed. Sounds like a painful procedure for a simple maintenance chore. I will make a mock-up of this in my next build session. Stay tuned . . . . 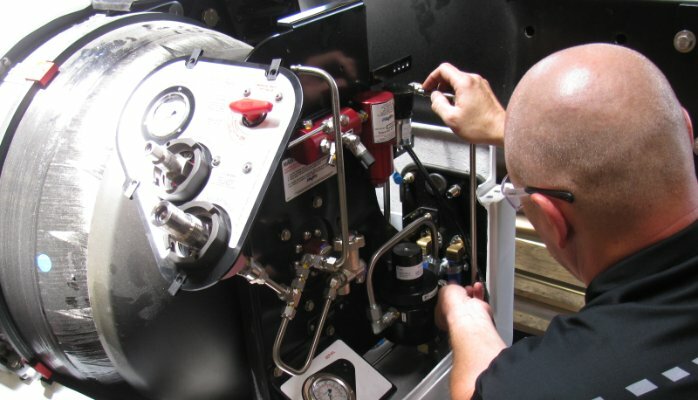 Repairing and maintaining a compressed natural gas (CNG) fuel system – with flammable gas and working pressures of 3,600 psi or more, can be safe if you understand and follow the rules. 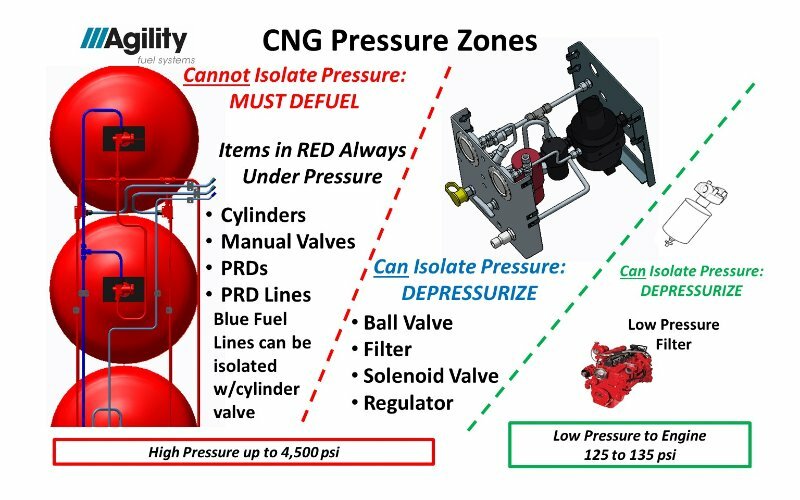 CNG pressure zones determine to depressurize or defuel. 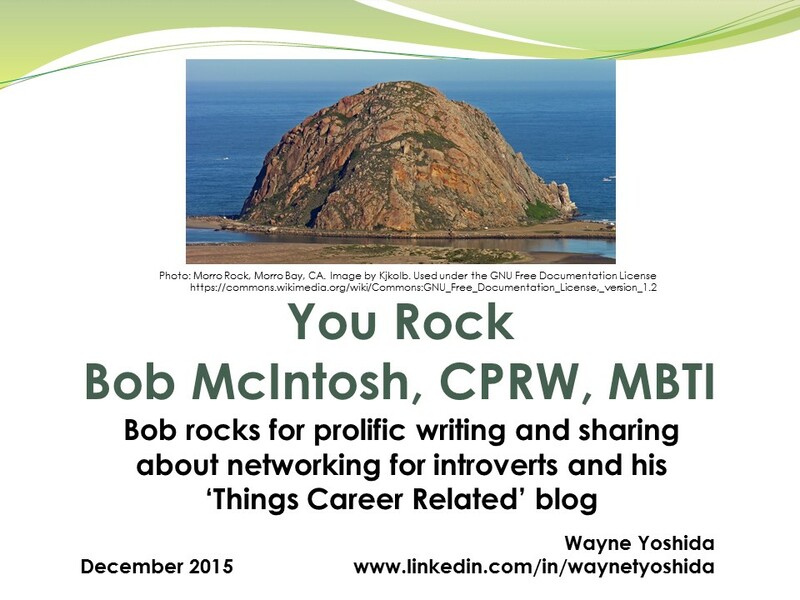 Read the full post here. 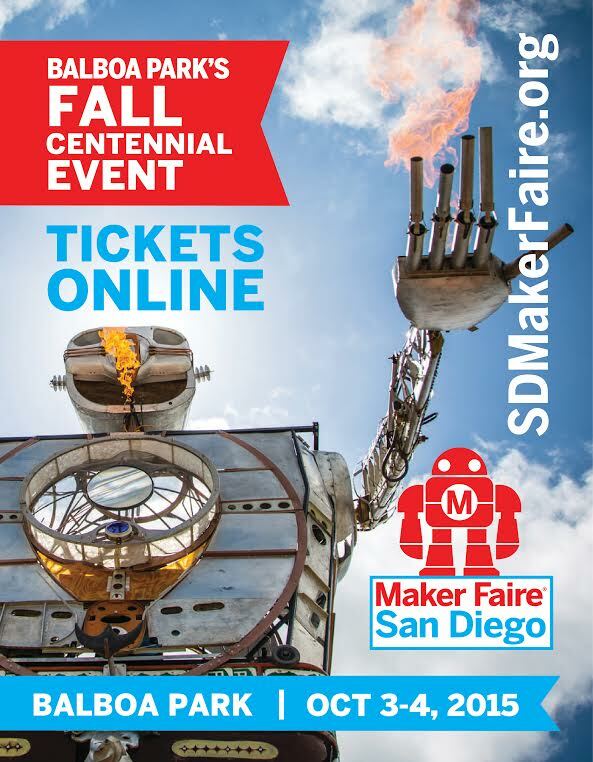 . .
UPDATE — See what Dennis W6DQ and I did for the San Diego Maker Faire! 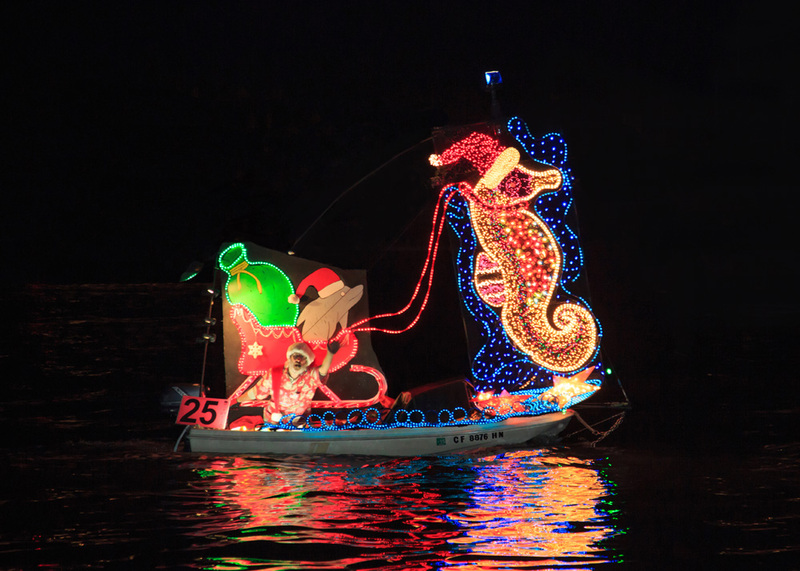 This is our fourth consecutive year as Makers. 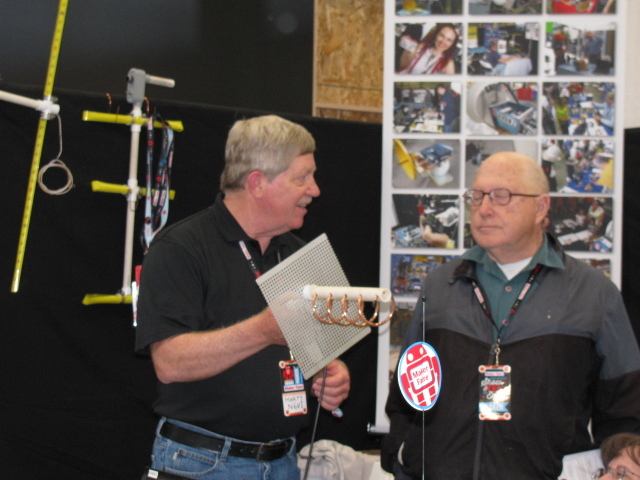 The 2015 SD Maker Faire team is Dennis W6DQ and Wayne KH6WZ. Our mission is to change the image of ham radio, making it both contemporary and chic in a hi-tech sort of way. We also want to emphasize how ham radio can be used for science and technology education and a possible career path for youngsters. 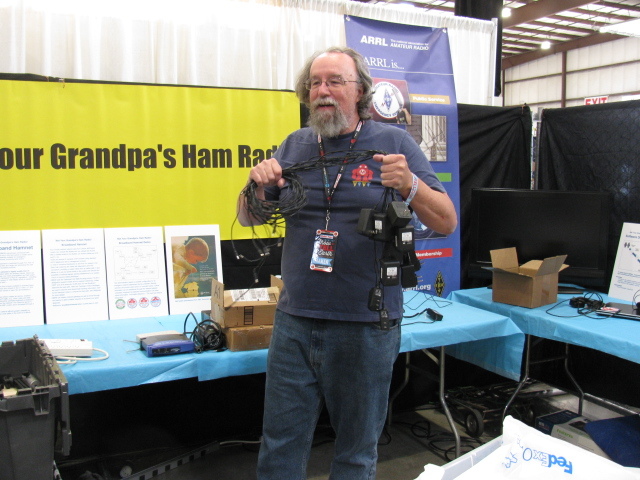 Amateur, or ham radio has always included teaching-learning-making-modifying-hacking and networking (making new friends) traditions for over a hundred years. We want to remind people this “new Maker Movement” is not really a new idea. 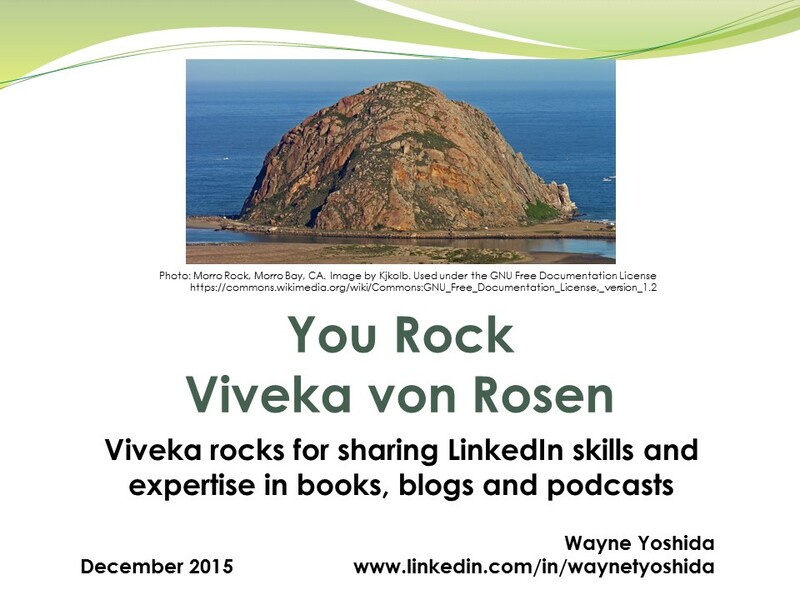 Read my LinkedIn Publish post called “The Original Makers” to learn more about this. We also want to show everyone that ham radio technology changes with the times, and continues to include both past and present to accomplish one thing: Creating ways to communicate voice and data over the ether, without wires. Here are some of the projects on display – stay tuned for more stories and pictures after the event! 20. Finding “non-touristy” off-the-beaten-path places to stay, eat, visit, etc. 25. 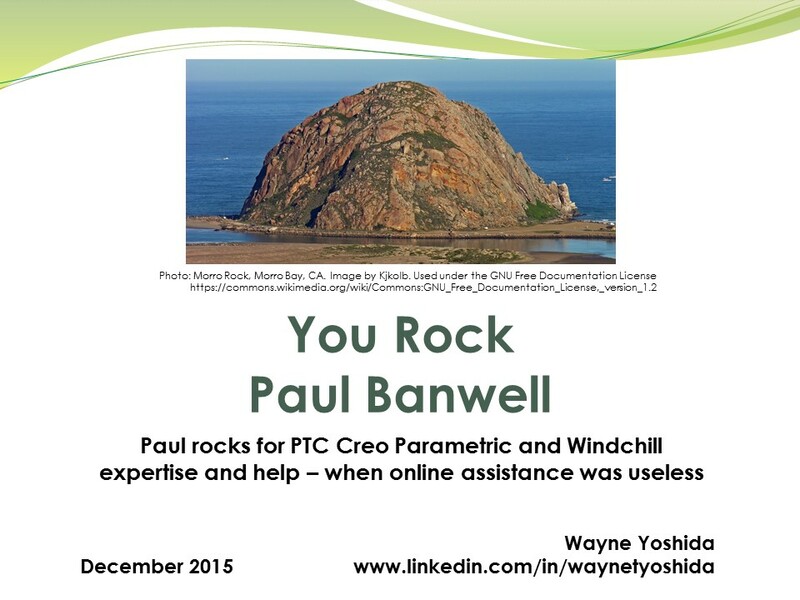 How many of your non-ham friends have actually talked to someone in some remote place such as Cape Verde or the Seychelles? 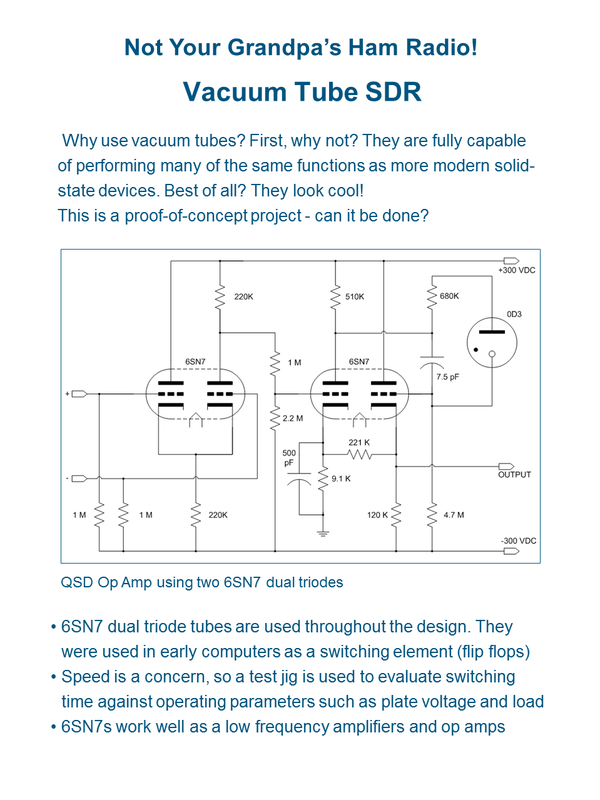 Take a look at the CQ magazine website to find more interesting things about ham radio.